The economical and user friendly alternative. TBF housings are constructed from high impact polypropylene to be compatible with a wide range of fluids and its ergonomic screw down lid is designed for simple hand operation allowing for a quick filter changeover. 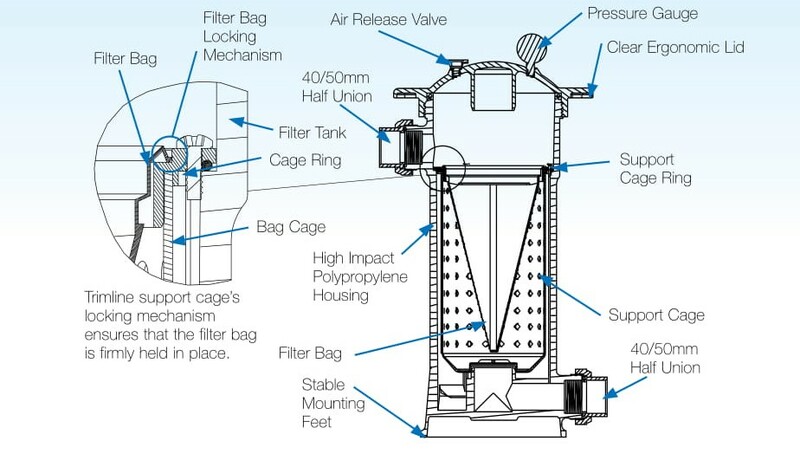 Its large filter bag is made of high strength and durable nylon, plus it's easy to clean.The 800 micron bag allows a full flow of water with minimal resistance, and it has a holding capacity is approximately four-times the usual leaf and debris holding capacity of a standard pool skimmer leaf basket.